Championship leader Jorge Lorenzo won the Dutch MotoGP in Assen to extend his lead at the top of the MotoGP championship. 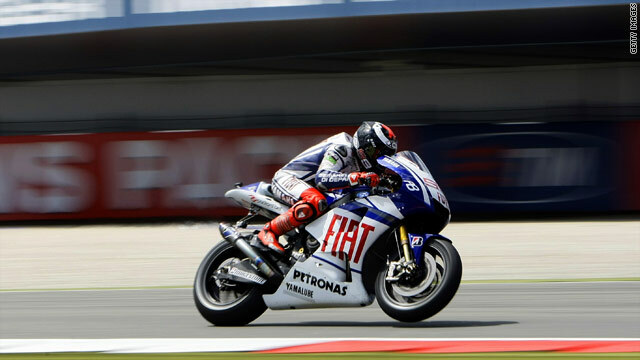 (CNN) -- Spain's Jorge Lorenzo made it four victories from six races as he cruised to victory at the Dutch MotoGP at Assen. The Fiat Yamaha rider finished 2.935 seconds ahead of Honda's Dani Pedrosa and former world champion, Australia's Casey Stoner, who secured his, and his Ducati team, a first podium finish of the 2010 season. Pedrosa made a brilliant start to the race moving up from seventh place on the grid and, for a time, challenged Lorenzo. But the championship leader soon eased into another gear and took control of the race. "This race has been a little bit more difficult than Silverstone," Lorenzo said, reported AFP. "I was surprised by the times that Casey and Dani were posting and I had to up it a gear or two to stay out in front and win the race," he added, reported AFP. Pedrosa praised his Honda team after the race for his podium finish. "They worked a miracle to get me this result and let us just hope that it is easier in the Catalan MotoGP next weekend," Stoner said, AFP reported. Stoner, the 2007 world champion, expressed satisfaction with his performance. "It is a nice result for us, although, it should have happened a lot earlier than this," Stoner said, AFP reported. Lorenzo's win extends the 23-year-old's lead at the top of the rider's standings to 47 points ahead of his compatriot Pedrosa who moves up to second place on 93 points. Italian rider Andrea Dovizioso who finished in fifth place, drops to third in the standings with 89 points. Dovizioso, who finished second behind Lorenzo at Silverstone last weekend, was beaten into fourth place by American rookie Ben Spies who overtook the Italian rider with 10 laps to go. Honda's Randy de Puniet, who started second on the starting grid, had to settle for sixth place after he made a poor start. Lorenzo, who was runner-up to his injured team-mate Valentino Rossi in last season's championship, now has 140 points with only a third of the season complete.